What are your online marketing goals? If you’re like most marketers, you’re looking to raise brand awareness, gain leads, and increase sales. Would it surprise you if I said email marketing outshines social media marketing by helping you tick all of these boxes? It shouldn’t. Email is an essential tool in your marketing toolbox, and the following are all reasons email out performs social media marketing. The first reason email marketing outperforms social media marketing is simple: people prefer receiving marketing messages via email. In fact, email is the number one medium individuals prefer for marketing messages. Sixty-six percent of people prefer to receive email marketing communications from retail companies, while only 23% prefer to receive these messages via social media. The preference for receiving marketing via email makes sense, as folks tend to use social media to interact with friends and family, but use email for business. So, although individuals use email for personal reasons, it’s also very popular for shopping and interacting with brands. In order to purchase something online, shoppers must provide their email address. If they are interested in shopping with the brand again, they can decide to sign up for the brand’s list in order to receive promotional messages. The only way potential customers see your email is if they make the choice to sign up for your list. Sixty-six percent of people prefer to receive email marketing communications from retail companies, while only 23% prefer to receive these messages via social media. This is different from social media marketing, which shows advertising whether you opted in to receive it or not. However, if social media users are using ad blockers, they can easily avoid your advertising. Furthermore, even if someone follows your brand on social media, they aren’t necessarily looking for promotions when they sign in to their social media accounts. Reach takes into consideration the number of individuals who can potentially come in contact with your advertising on a specific medium. 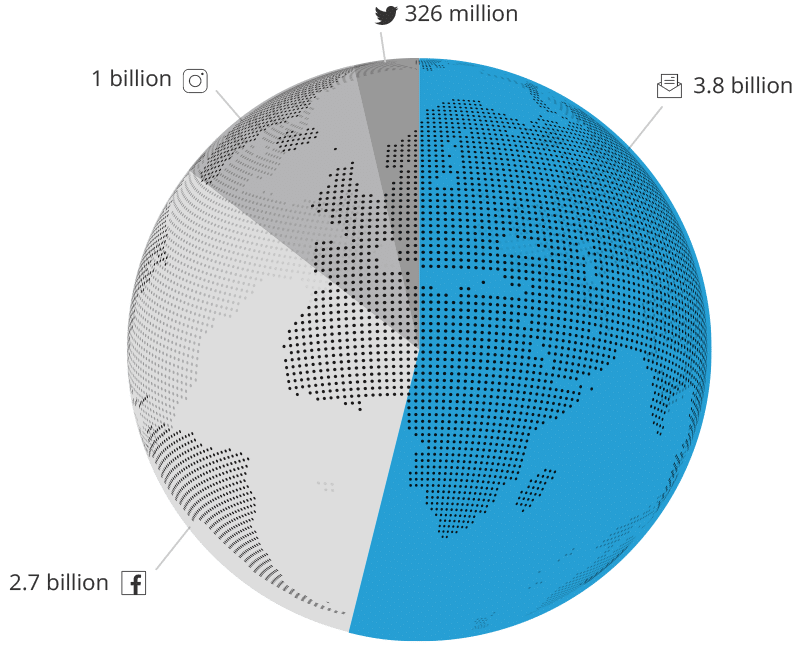 The reach for social media takes into account the total number of active users. For example, the worldwide monthly active user count for Facebook is 2.27 billion, Twitter is 326 million and Instagram is about 1 billion. However, there are over 3.8 billion email users worldwide. This means over half of the people in the world are using email. Now, these user numbers are huge, and there is no way your online marketing will reach all of those folks. Instead, when considering reach, think about the number of followers/Likes you have on your social media profile and the number of subscribers to your email marketing list. In recent years, Facebook’s algorithms have changed so the organic reach of your Facebook posts has decreased significantly. In 2018, Mark Zuckerberg announced that the new algorithm would favor private content (content posted by your friends on Facebook) over public content when determining what will display in your Newsfeed. In 2014, it was believed that organic reach on Facebook was about 2 to 6.5% per fan, and it is expected to be lower now due to the 2018 changes. For example, if you had about 5,000 followers, then only about 100 to 325 of your fans would see your post. Alternatively, consider an email marketing list of the same size. The average delivery rate of emails is 85%, meaning 4,250 of the 5,000 subscribers on your list would see the email in their account. Furthermore, according to MailChimp, the average open rate across all industries is 20.81%. That means an email sent to your list of 5,000 would be opened by 1,040 people and your marketing email would be seen by 320% more people than your Facebook post! Plus, if someone keeps your email, then they can access it again later in the day. Conversely, it isn’t guaranteed that folks will see your Facebook post in their Newsfeed again. Eighty-two percent of individuals in the United States access their email at least once a day, with 38% of people checking their email more than three times throughout the day. Not only that, but 31% say that checking email is the first thing they do when they wake up in the morning. Although the same percentage of folks (31%) say they check social media when they wake up, only 74% of Facebook users access the platform, 60% of Twitter users check Twitter, and 46% of users open Instagram every day. With more people accessing email every day, if you focus only on social media marketing, then you’re missing out on a big chunk of your target market. 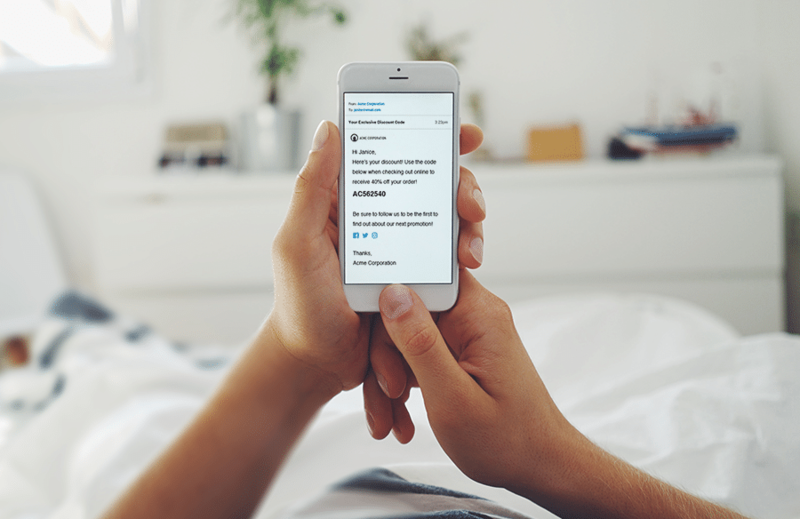 31% of individuals in the United States say that checking email is the first thing they do when they wake up in the morning. Social media platforms use fancy algorithms to decide whether or not someone sees your ad or post. With email marketing, it is your decision whether or not someone on your list receives your email. In other words, your email list is your own personal audience. Plus, when using social media advertising, you need to pay for access to an audience, but you don’t know who those people are nor do you get to keep their information for future marketing efforts. With email marketing, you don’t need to buy the leads you collected from anyone else, they’re YOUR leads on YOUR list. Clicks and conversions are the markers for success when dealing with online marketing. Email marketing outperforms social media marketing on both measures. For example, the average click-through rate for Facebook advertising is 0.9%, while marketing emails see an average click-through rate of 2.43%. This means out of 5,000 views, only 45 folks would click your link in a Facebook ad, while 122 people (271% more) would click the link in your email. Likewise, the conversion rate for Facebook advertising after someone clicks the link is 9.21%, while you see a conversion rate of 17.63% with email marketing. With these rates in mind, when considering 5,000 views, only four (4) would convert to a sale on Facebook, but out of 5,000 emails sent with your link, 22 would lead to a sale. Even though online advertising tends to be cheaper than traditional advertising like T.V. and direct mail, it’s still important to keep costs in mind. 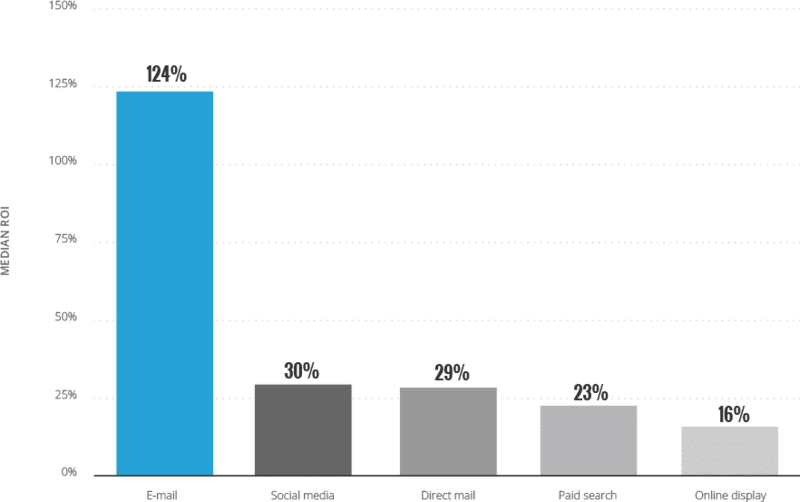 To this end, the return on investment (ROI) for email marketing is higher than social media marketing. This makes sense, because the formula to calculate ROI is income / cost, and you already know email marketing leads to more conversions. Worldwide, the average ROI for email marketing is 124%, meaning $2.24 is returned for every $1 spent, though some reports show this at closer to $38 per $1 spent. However, the ROI of social media advertising is only 30%, which is $1.30 returned for every $1 spent. The average ROI for email marketing is 124%, meaning $2.24 is returned for every $1 spent. But wait a minute. Before you start thinking that social media marketing is completely bogus, I want to reassure you — social media marketing is still valuable! In fact, social media marketing is especially good for engaging with customers, word-of-mouth marketing through sharing and collecting potential leads. So do make use of it for mid-sales funnel purposes like brand awareness and engagement. Despite its strengths, social media marketing is still less likely than email marketing to lead to a sale. However, you can leverage the strengths of social media marketing by converting your social media followers to email leads. This allows you to more efficiently move your social media leads down your sales funnel. Need some ideas on how to combine the two? Below are a couple of suggestions. The possibilities are endless. You can link to your lead generation campaign in a social media ad and post it on your profile in status updates or elsewhere. Bonus: Posting a campaign on your social media profile could help build your social media followers, who might become email subscribers in the future (if they aren’t already). Referral URLs to gain extra contest entries. Sharing on social media allows people who might not be aware of your brand to be exposed to it. Even though Facebook’s algorithms might not be showing Page content as frequently, they are still showing personal content. If someone shares a link to your lead generation campaign on their personal profile, then their friends might see it. This can lead to you gaining new followers and new emails on your list. In short, email marketing is more effective than social media for meeting your online marketing goals; however, the two compliment each other quite well. Social media provides an effective way to gain leads for your email list. In turn, email marketing can take the leads generated on social media and turn them in to conversions. 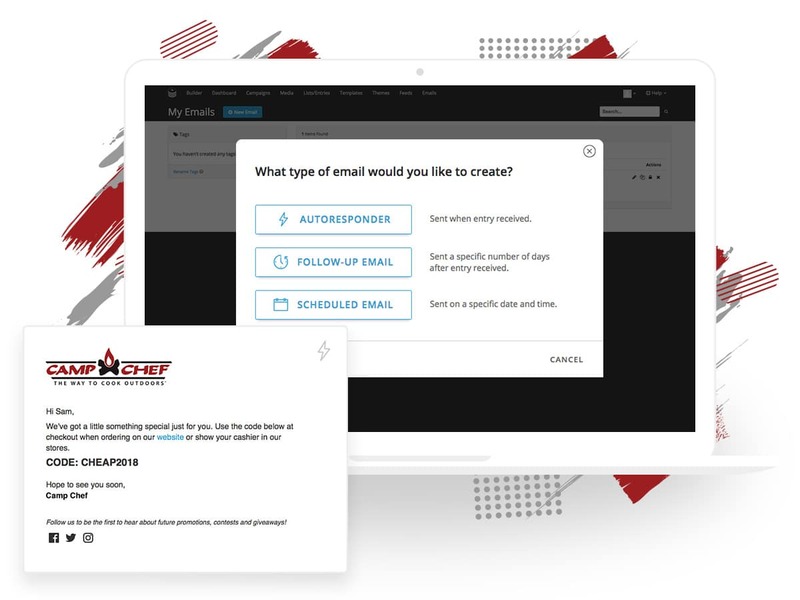 ShortStack allows you to create online marketing campaigns for your website and social media, then send emails to the leads you collect via your campaigns. Combining your online campaigns and email marketing in one platform allows you to save time and money. If you aren’t sure where to get started, just set up a call with our sales team or shoot us an email at theteam@shortstacklab.com.